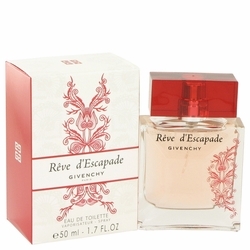 Created by Givenchy in 2014, Reve D'escapade exemplifies the spirit of exploration and adventure. Woody base notes and rose middle notes offer a hint of nature, ideal for the intrepid woman who wears this scent while trekking across the globe. Peach and massoia wood top notes round out this fragrance, providing you with a subtle sweetness that invites attention when you walk by. Take this with you on your next trip, and wear it day or night when you're feeling adventurous.